If you are looking for useful education board for learing of programming and electronics, maybe this news about project called EduBoard by Olimex could be helpful for your decision. The education board contains a lot of peripheral and the price is really interesting - only 15 USD. EduBoard is like prototype now, so the final specification can be a little bit different. The microcontroller which is used in EduBoard is ATmega32U4 which is supported in Arduino IDE. The micro USB connector is used for programming of microcontroller and also for powering of board. 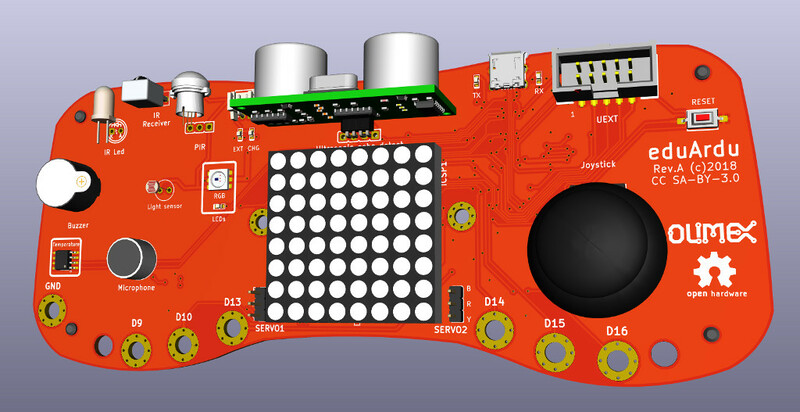 The board contains LED matrix 8x8, X-Y joystick, microphone, speaker, light sensor, temperature sensor, RGB LED, IR receiver, PIR sensor, ultrasound sensor, two connector for servo motors, charger IC for LiPo and UEXT connector for additional modules. You can connect more modules through this UEXT connector like IR transmitter, RS485 interface, BME280 (sensor of temperature/presure/humidity), RFID reader and also 2.8" colored LCD.